Some time ago, a reader introduced me to April Skin Magic Snow Cream. After doing some research and getting to know more about this product, I was intrigued enough to purchase it and try it for myself. Today, I will be sharing my thoughts on this product with you guys. Without any delay, let's begin with the review! 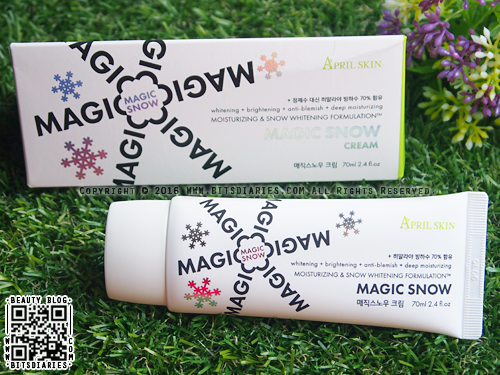 April Skin Magic Snow Cream acts as a moisturizer while providing instant and natural whitening effect leaving a hydrated and brighter-looking complexion. It is suitable to use on the face and body. The key ingredients are Himalaya Glacier Milk (70%) and Niacinamide. Himalaya Glacier Milk contains minerals such as chlorine, magnesium and zinc which nourish skin with moisture and stimulate skin metabolism. Niacinamide delivers long-term whitening effects.